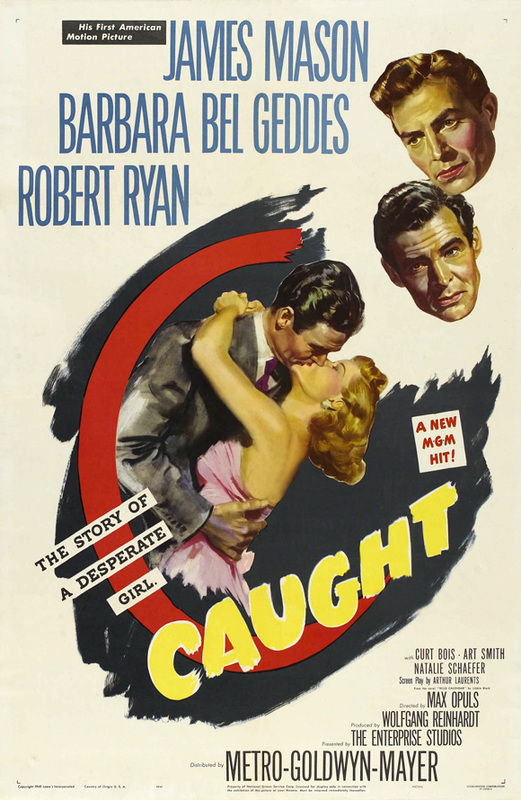 Cynical, controlling millionaire Smith Ohlrig (Robert Ryan) marries a poor model (Barbara Bel Geddes) to spite his psychoanalyst. When Leonora (Bel Geddes) realizes her marriage is a sham, she leaves to go work for a doctor (James Mason), but Ohlrig will stop at nothing to get his “possession” back. Both Bel Geddes and Ryan (whose character is based on Howard Hughes) turn in stellar performances in this melodramatic American noir film by Max Ophuls. Unfortunately, the script isn’t up to their standards, with key dramatic scenes seemingly missing, and certain characters’ motivations not fully fleshed out. Leonora in particular (despite Bel Geddes’ best efforts) isn’t consistent: she scrimps and saves to attend “charm school”, yet once she’s achieved a coveted position as a high-end model, inexplicably resists an invitation to a fancy shindig on Ohlrig’s yacht; despite her romantic notions, she marries Ohlrig without a second thought about what kind of person he may be; and she continues to hold on to idealistic notions about marriage (advising a patient’s daughter on how to snag a wealthy man in order to have a “happy” life) even after learning how empty her own is. Nonetheless, the compelling performances — and Ophuls’ brilliance, which shines through at key moments — make this film worth watching once. No, though fans of Ophuls and/or Bel Geddes will want to check it out. And the assessment pretty much nails it. It’s all served up well: looks great, directed and acted as well as it can be. But, pretty much aside from the (always wonderful) Mason and the down-to-earth Ferguson, there are major motivation problems running amok; kind of like watching erratic mood swings. Of course, they’re orchestrated by Ryan’s character – so there’s a reason – but that doesn’t make them interesting to watch. The tendency, for large sections, is to just not care. Basically, anytime Mason isn’t around, it all seems so…whiny. Speaking of the gay guy…what’s with the Tallulah Bankhead “dahling” bit? Would he really call Ryan “dahling” openly in front of about five other straight business associates? Hmm…an awfully bold display in 1949, I suppose.